The Organizing Committee of the 7th OpenTESOL International Conference invites participants to submit abstracts for the 2019 conference. 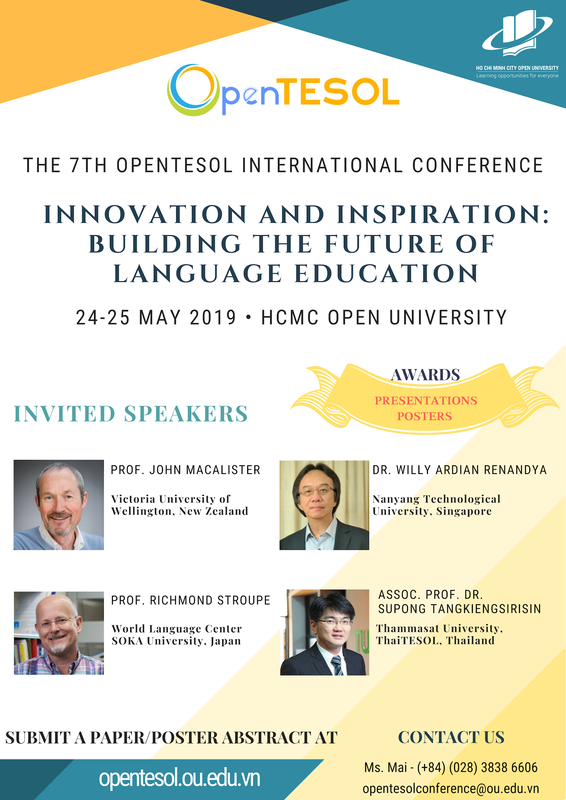 For the past 6 years, the OpenTESOL conference has become a meaningful space for teachers, researchers, students and professionals in the field of second language education, sharing research findings and classroom practices. The 2019 conference will continue to be a milestone for all participants' continuous professional development. What futures may hold for language education? Under the impact of disrupted technologies, how can language educators design language learning? Under the impact of glocalization and internationalization, to what extent out-of-class projects enhance learning? In under-resourced, large classrooms, how can language educators creatively design instructional sequences? What findings and implications of practitioners' research should policymakers be informed of? Abstracts should be written in English and no more than 200 words. The abstract must convey the topic's importance and relevance to the conference theme. Acceptance notification will be sent as soon as review process is over. Click the 'Submit An Abstract' button to go to the submission system. 1. Create an account to begin the submission process. Make sure you tick the Create Account as Reader and Author boxes. 3. From the User Home tab, click New Submission to input details of your abstracts. 4. An acknowledgement email will be sent to your mail box. If you have never presented at a conference but are willing to share an important teaching technique or research finding at OpenTESOL 2019, feel free to contact us at opentesolconference@ou.edu.vn for mentorship (with a subject line including 'OpenTESOL 2019 Mentorship'. Our experienced presenters/mentors will guide you through the process, making your first conference presentation engaging and interactive. as invited speakers on the main conference day on 25 May. The speakers also facilitate pre-conference workshops on 24 May. For information about the invited speakers and speeches, please visit the invited speakers page. After the presenters are informed of their accepted abstracts, they can prepare and submit the full papers for consideration in the conference proceedings by 1 April 2019 . The full paper must be between 2,500 and 3,500 words (excluding the title, references, and appendices). More details regarding the conference proceedings procedure will be published soon. The registration fee includes tea-break refreshments/snacks plus a hard copy of the conference proceedings. Please note that if presenters' full papers are successfully peer-reviewed, the presenters should pay an extra fee of 500,000 VND for inclusion in the conference proceedings.